The record is made up of 1 file (27 folios). It was created in 30 Jan 1931-4 Jun 1931. It was written in English. The original is part of the British Library: India Office The department of the British Government to which the Government of India reported between 1858 and 1947. The successor to the Court of Directors. Records and Private Papers. The file contains copies of correspondence sent to the India Office The department of the British Government to which the Government of India reported between 1858 and 1947. The successor to the Court of Directors. by the Colonial Office and the Foreign Office, mostly regarding the exchange of diplomatic representatives between Persia [Iran] and Iraq. It largely consists of copies of correspondence between the office of the High Commissioner for Iraq and the following: the Secretary of State for the Colonies; the Government of India, Foreign and Political Department; the Ministry of Foreign Affairs, Baghdad; and Raymond Cecil Parr, British Legation, Tehran. The correspondence concerns the appointment of Mirza Taqi Khan Nawabi as Persian Minister at Baghdad, and of Taufiq Beg al Suwaidi [or Tewfik al Suwaidy] as Minister for Iraq at Tehran. 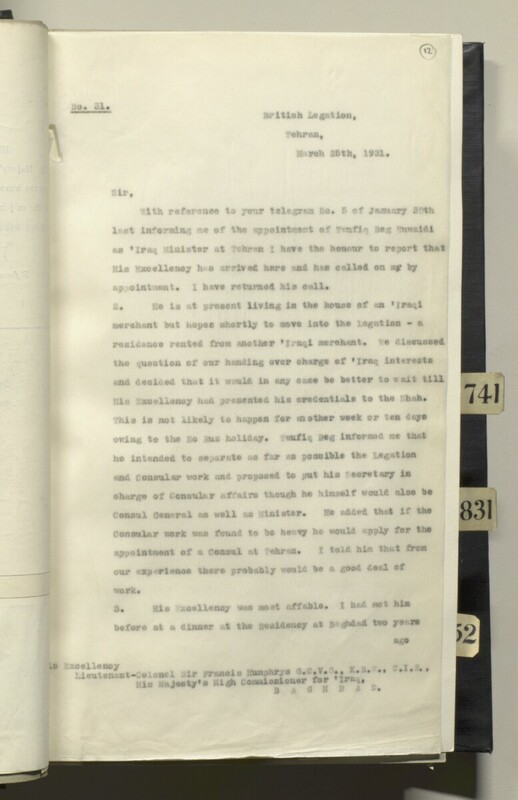 It also includes correspondence between the British Legation, Tehran, and the Iraq Legation, Tehran, and between R W Rendel, Foreign Office, and Robert Clive, Tehran, regarding the transfer of files concerning outstanding claims of Iraqi camel men in connection with the alimentation crisis. The papers are arranged in reverse chronological order from the front to the rear of the file. Foliation: the foliation sequence (used for referencing) commences at the first folio with 1, and terminates at the last folio with 27; these numbers are written in pencil, are circled, and are located in the top right corner of the recto The front of a sheet of paper or leaf, often abbreviated to 'r'. side of each folio.